EFFECT: This is a basic die box effect, but with a red die and a yellow die. 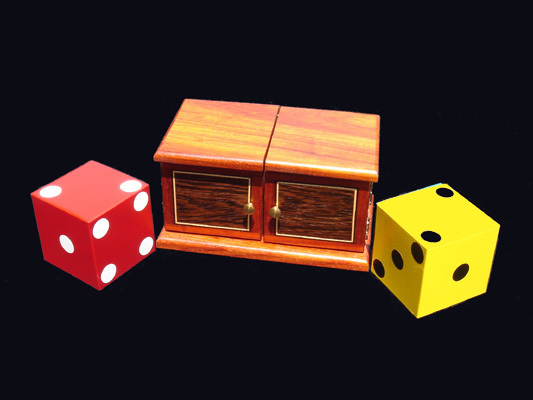 The yellow and red dies are each placed into the die box, one in each of the two compartments. The first effect is that they change places. Secondly, they both vanish from the box, only to be reproduced as a blue die and a green die. A few of these were made by Thayer years ago (Albo series Vol. 2, pages 17 and 18). The Magic House of Babcock has added contrasting wood panels on the front doors and ends of the box. Joe Stevens and Twin Cities Magic have featured this on their Die Box DVD. Included with this beautiful prop is a fantastic professional routine by Larry Wilfong of Scottsdale, Arizona.